A prerequisite to setting up remote access is a VoxiorLink device and at least one configured gateway for which you want to enable remote access. To do this please follow these instructions. After VoxiorLink device is set up a new tab named 'Remote Access' appears in the navigation bar. To enable Remote Access click on the toggle button next to the user you would like to set up Remote Access for. 'My access' configures access of the owner of the smart home while 'Installer access' configures access of the professional installer of your smart home. When enabling a user for the first time the user is asked to enter a password used to protect the security certificates. You need to remember this password as Voxior does not store it and it's required whenever VPN certificate is imported to a new phone or computer. You can also reset the password by clicking on the 'Edit password' button. An email with certificates will be sent out automatically to the respective user. To send the certificates to a specific email click on the 'Send to' button and specify the email you would like to send the instructions and certificates to. Double click on the .mobileconfig file attached to received email. This file includes both certificates (user and ca certificate) and a VPN On Demand configuration. You will be redirected to Install Profile page and prompted to install Voxior Profile. Click "Continue". Enter the password for the client certificate you entered when enabling Remote Access for this user. 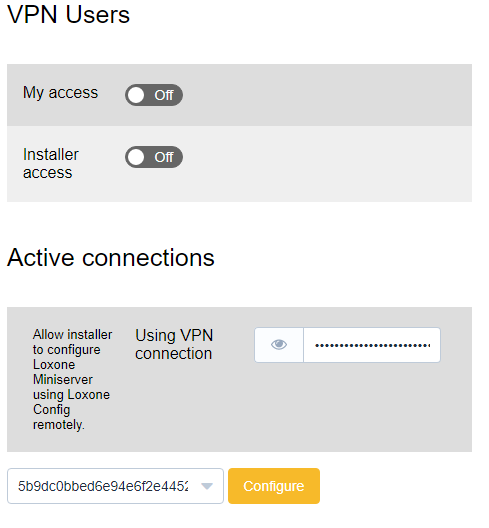 To use VPN connection simply go to provided Voxior remote link and VPN will be automatically established using VPN On Demand configuration. Congratulations! You have successfully set up Voxior VPN on your macOS device.